Yale World Fellows brings rising stars from across disciplines and borders for an intense and unpredictable mash-up of ideas, world views and experiences. 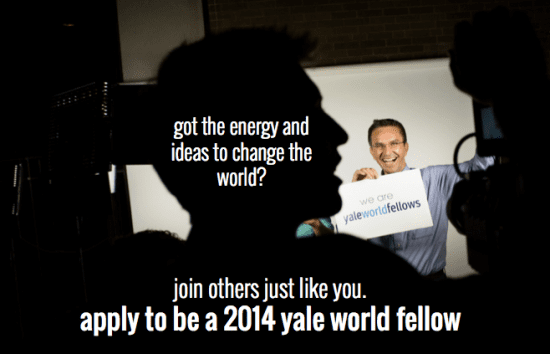 Applications to the Yale World Fellows Program are accepted from across sectors and around the world. Each class of Fellows is a unique group, geographically balanced, and representative of a wide range of professions, talents, and perspectives. Each year, the four month, on-campus residency program exposes 16 emerging global leaders to new ideas and ways of doing and thinking. They’re given access to all that Yale has to offer: courses, research, institutions, professors. Fellows are given time and freedom to let their minds explore. Bankers deconstruct modern art, engineers read the classics, activists demystify markets, diplomats test game theory. Brilliant minds are refreshed, challenged and expanded. Fellows are mid-career thinkers and doers on a clear trajectory of success. They’re dynamic, creative practitioners who have already been recognized for their work and would benefit from time at Yale to explore critical global issues and cross-disciplinary studies, sharpen leadership skills and build relationships with other emerging leaders. BE IN THE MID-CAREER STAGE Fellows are at least five, and typically not more than twenty, years into their careers, with demonstrated work accomplishments, and a clear indication of future contributions and excellence. The average age of a World Fellow is 39, though there is no minimum or maximum age limit. Final decisions will be announced in April 2014. All applicants, both successful and unsuccessful, will be notified of their status at that time. Still haven’t got your entries in? Well, it’s the final month for submissions to Google’s new competition ‘Africa Connected: Success stories powered by the web’. Google hopes to find the most inspiring stories in Africa about how the web has transformed the lives and business ventures of its users – Africa, get connected! Five successful entrants will win $25,000 each, and will also have the opportunity to work with a Google sponsor over a six-month period to further their business success. Entries close on 31st October 2013 – categories include Education; Entertainment/Arts/Sports; Technology; Community and NGOs; and Small Businesses. “From Madagascar to Morocco, from big metropoles to rural villages, from photographers to community activists, we’ve already received hundreds of submissions about how people are using the web and technology to do cool and extraordinary things to overcome hurdles and be successful. There’s less than a month to go before the competition closes, so if you have a great story that you haven’t yet told us about, we definitely want to hear from you” says Affiong Osuchukwu, Google Lead for the Africa Connected initiative. A great example of Africa’s talent is Chike Maduegbuna, owner and creator of Afrinolly, based in Nigeria. Afrinolly is a popular mobile app, which lets people across the continent watch short videos on their mobile devices. This app has transformed Nigeria’s Nollywood film industry by creating a movie trailer platform for new audiences. With over 3 million downloads already since its launch in August 2011, Chike hopes this will create a platform that connects aspiring film professionals with global film industry veterans. 20 lucky semi-finalists will be interviewed and will have the opportunity to create a short promo video. Judges will then narrow it down to 10 finalists, from which 5 winners will be chosen, based on public online voting. Winners will be announced in March 2014. New to the web and want to be amazing? Learn more about the web and Google through this platform. Tags: ‘Africa Connected: Success stories powered by the web’. participation of young women in the Womens Networking Zone. developments and lessons learnt, and collectively chart a course forward. collaboration with international and local partners. a community-led forum running parallel to the IAC. organizing and movement building at AIDS2014 and beyond. AIDS Conference 2014 and beyond. owned by and for young women. contribution of UNAIDS towards this project is gratefully acknowledged. Program and the WNZ at AIDS 2014.
attend AIDS2014. This however is not guaranteed. with priority given to key populations and ensuring regional variation. All applicants will be notified on email on Wednesday 30th October 2013.
hours increasing in the lead up to AIDS2014 in July 2014. HReade is pleased to inform you about the Oando Marketing PLC’s Career Fair. The fair, themed “Demonstrating Superior Brand, Attracting Superior Talent“, is a career fair designed to provide information about career opportunities and create a credible platform to learn about the company and foster interaction with potential employees. Oando Marketing PLC is a fully owned subsidiary of Oando PLC and Nigeria AOS leading retailer of petroleum products with a vast distribution network with over 500 retail outlets around the country. In addition, the company has significant investments in Liquefied Petroleum Gas (LPG) and Lubricants manufacturing, as well as operational subsidiaries in Togo and Ghana. Please be informed that attendance at the Career Fair is strictly by invitation. We, therefore, invite you to indicate your interest by uploading your CV to www.oando-cvmanager.com. The National Youth Service Corps (NYSC) scheme has bagged a UN award for its active participation in a recent offline survey conducted by the international body. Alhaji Abdulwahab Obomeile, the Director, Community Development Service and Special Projects Department of the corps, made the disclosure on Monday in Abuja at the award ceremony. He said that the award; “My World: A Global Survey For Citizens’’, was an initiative from the UN, which is an options survey carried out through creative Online and Offline methods. `It allows people across the world to tell the UN in particular and the Secretary-General’s High Level Panel, the most important issues they would like the Post-2015 agenda to address after the expiration of MDGs agenda,’’ he said. He added that the NYSC in Nigeria, using the Corps Volunteers of NYSC MDGs Advocacy Programme, was actively engaged in the offline survey, which took place across the country in March. `We partnered with the UN Millennium Campaign Nigeria, OSSAP-MDGs and CISLAC, and engaged over 1,000 youth corps members as field volunteers to administer the questionnaires in the 774 local government areas in Nigeria,’’ he added.He said the survey was structured to capture two persons per 100 households in each of the 774 local government areas. `The total number of the votes came to 145,672 citizens, 67.2 per cent of which were rural dwellers, 45.5 per cent were youths and 46.5 were female.`It is worthy of note that some of these areas face security challenges and cultural barriers where women are not allowed to express themselves, but the Field Volunteers worked around these situations,’’ he said.Obomeile saluted the resilience and hard work of the corps members who remained committed and resolute in carrying out the exercise within five days. Also speaking, Hilary Ogbonna, the National Coordinator, UN Millennium Campaign, Nigeria, said the MDGs had made a huge impact on the lives of many Nigerians. “But there is still much more to be done to address extreme poverty, diseases and environmental crises among many others,’’ he said. Responding, the NYSC Director-General, Brig.-Gen. Nnamdi Okore-Affia, said he was most excited to receive the award on behalf of the NYSC. Launched in January 2013, this program is designed for emerging and established women leaders who are committed to ending economic disparities for women and girls, violence against women and forced/early marriage, through business, service provision, advocacy, media or public service. Vital Voices Global Partnership, the preeminent non-governmental organization that identifies, trains and empowers emerging women leaders and social entrepreneurs around the globe, embarked on this groundbreaking partnership with the UK government’s Department for International Development (DFID) through the formation of VVLead in late 2012. Recognizing that in order to advance the causes of women, women themselves must connect with, empower, equip and inspire one another at all levels of society, Vital Voices and DFID are committed to helping create a unified response, not just from women’s rights activists and sectoral experts, but also from a wide range of professionals and practitioners across fields and methodologies. VVLead is a critical step in this response. VVLead offers Fellows the opportunity to work through a combination of online and in-person activities to build critical knowledge, skills and abilities through targeted trainings; foster support and empowerment via exchanges and peer-mentoring; share best practices and lessons learned across issue areas and regions; use challenge grants to develop innovative models to address longstanding problems; and focus on personal leadership and professional goals and objectives. For more information, please see the attached overview of programmatic offerings and view the VVLead Prezi athttp://prezi.com/vx5b8kaqeu0r/apply-for-the-2014-class-of-the-vvlead-fellowship-program/?utm_campaign=share&utm_medium=copy. I hope that you will consider applying to take part in this unique opportunity. VVLead applications may be accessed at http://www.vitalvoices.org/global-initiatives/vvlead-fellowship-program. Applications for VVLead will be accepted until Sunday, November 3rd at 5 p.m. EST. Additionally, should you work with a women leader whom you think would be interested in applying for VVLead, please don’t hesitate to send the application along. Our mission is to offer a user-friendly, demand-driven one-stop service community where you can find and share resources and tools for women’s economic empowerment and connect with experts, peers, networks and potential partners. We aim to create a cross-collaboration network between women and girls, men and boys, and advanced experts and professionals and enhance women and girls’ capacity to drive innovation for a better world. Do you want to become one of the Knowledge Gateway’s Global Community Champion for Women’s Economic Empowerment? Get recognized! We will provide you with support and guidance on online community engagement and advocacy for women’s economic empowerment. empowerment through exposure to key experts and leaders in this area. We are asking for 6-7 hours of your time per week for up to 6 months and you can work from anywhere with an internet connection. The online collaboration will be coordinated with the KG team. Your volunteer input will help us achieve community collaboration, create an opportunity to bring issues that are far from the global attention and co-create solutions with a global community support. 7.Participate in mentorship events and activities with women entrepreneurs. The DO School is pleased to partner with The Swedish Fashion Company H&M in presenting the Green Store Challenge. The goal of this DO School Challenge is for the selected Fellows to create a Green Store prototype in ten weeks. This prototype must be sustainable in terms of materials, construction, energy, operation and other aspects and will be realized in Germany. It should be scalable to H&M stores worldwide, be economically beneficial and make the idea of sustainability tangible for customers and employees. By answering to the Challenge, you will have learned hands-on how to turn an idea into action during the ten-week Incubation Phase. This process is supported by participation in Challenge Lab, a course which offers the knowledge, skills, and tools necessary to successfully solve the Challenge. Successful candidates may come from, but are not restricted to the fields of engineering, architecture, fashion and design, as well as environmental activism, retail and human resource management. The DO School offers offers a unique one-year fellowship program for emerging social entrepreneurs who look for training, mentoring and empowerment to start their own ventures. Selected Fellows receive a full scholarship covering the tuition fee for the year. From September 2013 to January 2014 the DO School invites applications from motivated individuals aged 18 to 28 from around the world to participate in the DO School Green Store Challenge.Successful applicants will show exceptional motivation to contribute to solving the Challenge and developing and starting their own social venture. Selected Fellows will spend the first ten weeks of their one-year program on the DO School campus in Hamburg from April to June 2014, and the following ten months in their home countries implementing their own ventures. From September 2013 to January 2014 the DO School invites applications from motivated individuals aged 18 to 28 from around the world to participate in the DO School Green Store Challenge. Successful applicants will show exceptional motivation to contribute to solving the Challenge and developing and starting their own social venture. The DO School is an innovative educational institution. We offer a unique one-year program enabling talented emerging social entrepreneurs to launch their own innovative and sustainable ventures. The program allows its participants – our Fellows – to learn from passionate peers, engage with current leaders and experts, and create change by implementing their social start-ups in their home countries. Annually, the Urban Youth Fund gives youth led projects worldwide an opportunity to materialize their innovate ideas towards urbanization with the aim of indulging the youth in the UN-Habitat mandate. This year, by the deadline of 15 April 2013, 8,449 applications from youth-led organizations in 129 countries had been received by the fund, Africa and Asia pacific/Arab regions yielded the largest number of successful applicants. Applications received went through a rigorous evaluation process, including a check of eligibility, a quality assessment, shortlisting, vetting by Habitat Programme Managers and a final selection of projects by the Steering Committee. The selected projects were then approved by the Advisory Committee. Most of the projects are from the Africa region while Asia Pacific/Arab region and Latin America and Caribbean region share the same number of projects. A majority of the proposed projects aim at providing employment for young people living in cities. With special interest in this year’s cycle, the Urban Youth Fund received a large number of projects that aim at increasing the participation of young people in urban governance, urban agriculture and climate change related projects. All beneficiaries are required to ensure equal participation of young men and women in their projects, as well as ensure that the impact is gender responsive. Some of the approved projects include initiatives that establish scorecards used for monitoring and evaluating the new leadership and governance in Kenya, in relation to the devolution systems. Other projects include young citizen’s media that aim to use media to educate the young population on good governance and responsibility. As well, waste management, housing rights, vocational training and micro-finance, climate change education and capacity building are areas that other projects will be working on. Particularly encouraging are the many projects that combine different urban development issues and engage with local governments, the private sector and other actors to ensure the long-term sustainability of the projects. The India Youth Fund Window is a partnership between UN-Habitat and the Narotam Sekhsaria Foundation (NSF) under the global Urban Youth Fund. The funding window aims to advance youth empowerment in India.